Thanks to Roberto Aguilar for sharing. Please attend the Austin press conference tomorrow in solidarity! Also consider signing this petition. Note: Don’t pay for public parking. Go inside to the ESB-MACC office and get a parking pass that you can slip into the dash of your car. The K-12 Committee of the National Association for Chicana and Chicano Studies, Tejas Foco (Chapter) is sponsoring press conferences in six cities tomorrow (Wednesday, May 30) on the State Board of Education and its vote to change the name of the Mexican American Studies course. One of these press conferences will be held in Austin. K-12 Committee members want to bring attention to the decision by the State Board of Education to change the name of a Mexican American Studies course for our public schools to Ethnic Studies: An Overview of Americans of Mexican Descent. We also want to invite people to show up for the June 12 Board meeting. During this board meeting, we will protest the name change. We will also be calling for the adoption of a Women and Gender Studies course and the creation of a resource center that would include curricular materials for teachers wishing to teach Mexican American Studies, as well as other fields of study. On Friday, April 13, 2018, the Texas State Board of Education (TXSBOE) approved Texas Essential Skills and Knowledge (TEKS) standards for a Mexican American Studies (MAS) elective course for high school students. This is the first time in Texas and U.S. history that a state board of education approved a MAS course. The TXSBOE also voted to open the process to create other Ethnic Studies courses, including Native American Studies, African American Studies, Latino Studies, and Asian/Pacific Islander Studies. 3. The stated reasons for changing the Mexican American Studies title are ahistorical and misleading. The term Mexican American is not divisive or biased. Mexican American has been the most popular English language self-referent since the early 1900s and the typical way to refer to Mexican-origin persons in the U.S. It affirms an American identity and national allegiance at the same time that it claims a Mexican ancestry. The term is no different from others, such as African Americans, Italian Americans, and Native Americans. Lastly, the use of the term Mexican expands the cultural meaning of American. 8. The word "Overview" in the name change calls for a cursory treatment and not an in-depth examination of the subject, in contradiction with the broad purpose and content of this course. In addition, Mexican Americans/Chicanxs do not identify with the term “Americans of Mexican Descent.” It is a throwback to the 1950s Jim Crow era of segregation when Texas school officials disparaged the racial and ethnic makeup of Black and Brown youth. In light of the renaming action by the TXSBOE, and all the reasons stated above, our questions for the nine Anglo Republicans and one Latina Democrat who voted for this name change are: What are the real reasons that you voted for this name change? Is it true, as board member Bradley stated to the press, that the TXSBOE would have never voted for the approval of this MAS course if the name had not been changed? And if so, why not? Who gave the very partisan TXSBOE the right to change the name of an entire and significant ethnic group of people in Texas and the U.S.? Why was Mexican American Studies singled out? Does this constitute outright discrimination, or conscious/unconscious political bias? Mexican Americans, and the diverse students of all colors and ethnicities in Texas public schools have the right to learn and understand the many positive contributions Mexican Americans and other ethnic groups have made to Texas and American history. The National Association for Chicana and Chicano Studies Tejas Foco Committee on Mexican American Studies Pre-K-12 has been working tirelessly over the last five years to advance Mexican American and other Ethnic Studies in Texas schools with significantly positive and historic results. 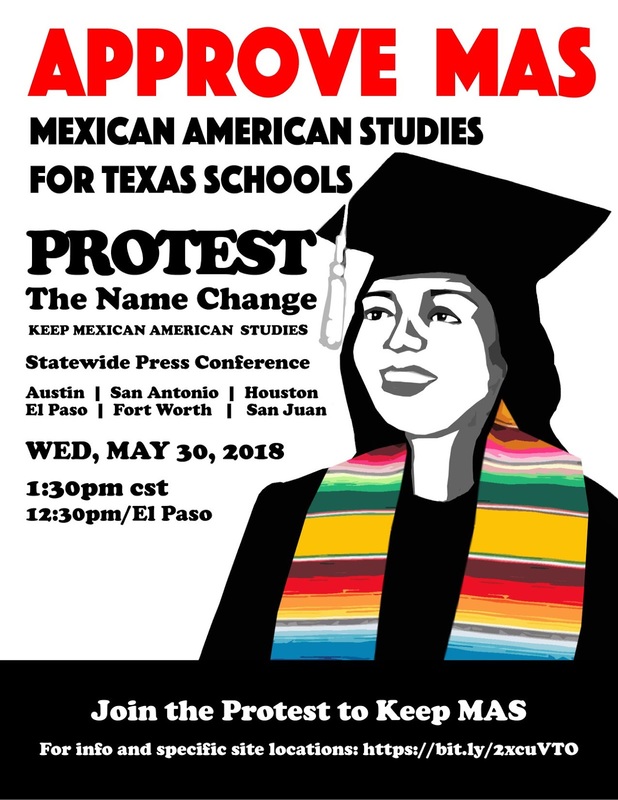 The recent decision by the TXSBOE to misname this Mexican American Studies course represents another obstacle to our work, and a hindrance to learning in our schools. We are committed to opposing this name change until the TXSBOE adopts the original title of this course: Mexican American Studies. This NACCS Tejas Statement will be presented to the elected members of the Texas State Board of Education at their next meeting on Tuesday, June 12, 2018 at the William B. Travis Building (1701 Congress Ave., Austin, TX 78701). A "Protest the Name Change Press Conference & Rally" will precede the board meeting from 8:30-9:30am. The public is invited to attend the Rally and to testify before the board.